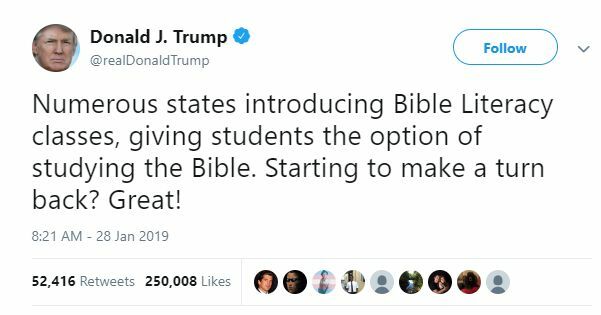 WASHINGTON — President Trump tweeted his support on Monday for recently-introduced state bills that would authorize the creation of elective Bible courses in public schools. “Numerous states introducing Bible literacy classes, giving students the option of studying the Bible. Starting to make a turn back? Great!” he wrote. Trump’s remarks reportedly came after Fox & Friends interviewed North Dakota state Rep. Aaron McWilliams about a bill that he had co-sponsored, and noted that legislation has been presented in other states as well. “Without allowing a Bible into the schools, without allowing a Quran or any other religious text in the school, we look at establishing a religion of secularism in our schools without having anything else,” he stated, according to a report from Fox. However, Education Week reports that the bill was rejected by the state Senate 42-5 on Friday. A similar bill was also filed in Florida by Democratic Rep. Kimberly Davis, and Indiana and Missouri are likewise set to vote on the option. “The courses should not be taught from the perspective that the Bible is a literal historical record, and such courses must expose students to critical perspectives on the Bible and a diversity of scholarly interpretations,” Boston wrote.